Many of our kitchens are now equipped with this handy helper – the microwave oven. 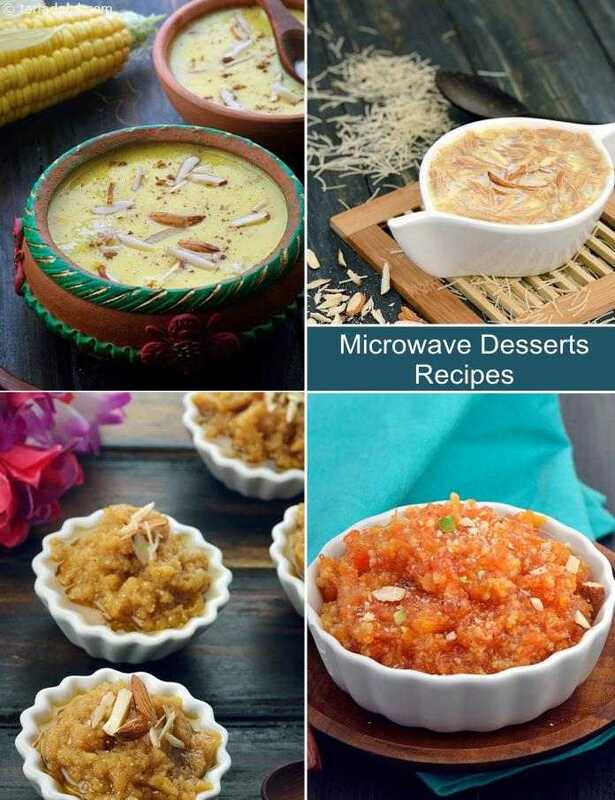 It helps make mouth-watering desserts like Carrot Halwa , Chocolate Mug Cake , Doodhi ka Halwa , etc., in a hassle-free and quick way. A mithai that is famous and well-loved all over India, the Coconut Barfi can now be prepared easily in the microwave oven. No need to sweat over the consistency of the sugar syrup or any such complications. Just follow the simple instructions, and very soon you will have a mouth-watering sweet, with the rich texture and flavour of coconut and khoya tinged with the intense aroma of saffron. You just need to know the right ingredients and proportions to use, which this section will help you with. Sevaiyan (vermicelli) ki kheer is a recipe that has withstood the test of time and geographies, being a favourite all over the country. Nickname it noodles kheer, and your kids will slurp it up too!